Girl teenager winter warm pajamas sitting by the window and use a smartphone. Outside the window it is snowing. 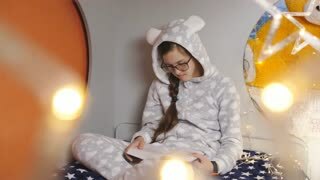 Girl teenager warm pajamas talking on a cell phone with a friend while sitting in bed with a Teddy bear. Girl teenager warm pajamas using the laptop sitting on the bed. Girl teenager in warm pajamas on Christmas break reading a book sitting on the bed, close-up. Girl teenager in the room on bed in warm pajamas through the Internet on the laptop. The girl the teenager reads the book sitting on the bed in warm pajamas, close-up. Girl teenager warm pajamas lying in bed and playing on smart tablet. The girl the teenager reads the book sitting on the bed in warm pajamas. Girl teenager in warm pajamas on Christmas break reading a book sitting on the bed.